Round 17, 2018: Sandringham 6. 11. (47) defeated by Box Hill 11. 12. (78) at Trevor Barker Oval. The Box Hill Hawks will take on Sandringham for the Blue Ribbon Cup this Sunday at Marvel Stadium. The Hawks kicked off their premiership defending campaign with a commanding victory last week, dominating Casey in a grand final re-match by 62 points. The reigning premiers controlled every facet of the game, matching the Demons inside contested midfielders, to then unleash their destructive free-flowing attack on the outside. It was raining goals at Box Hill City Oval as Jackson Ross burst out of the blocks to boot three scintillating majors in the first term. The rangy forward never looked back, and had the ball on a string in producing a career best performance to finish with five goals for the match. Ross combined exquisitely with tall forwards Mitch Lewis (four goals) and Ryan Schoenmakers (two goals) who dominated the one-on-one aerial contests up forward, and will no doubt provide Sandringham with headaches in defence. Their opponents this week, Sandringham, went down by 43 points to Footscray in the VFL season opener last Friday. New Skipper Brede Seccull was the Zebra’s best in a disappointing outing for the visitors, accumulating 25 disposals and two goals. Saint David Armitage looked a cut above the rest, racking up 20 disposals and ten tackles, in his bid to return to St.Kilda’s senior team. Pre-match Skipper Andrew Moore presented guernseys to seven club debutantes, and the Hawks will look towards this week as another opportunity to gel together as a collective unit. Max Bailey reflected on the significance of Round 1’s victory for the season. “The good thing about playing Casey last weekend was that it played into our strengths. We tried to match them in the contested ball with our strong inside midfield, and then really focused on moving the ball effectively inside 50,” he said. “We need to stick to playing our system. The big thing for the Hawthorn boys playing for Box Hill is learning to play in our system. The contest will customarily mark the Blue Ribbon Cup, honouring Victorian Police Officers who have lost their lives in the line of duty, with the player judged best afield to be awarded the Silk-Miller medal. 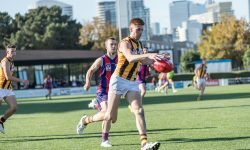 Box Hill will kick off a doubleheader for the Hawks when they take on Sandringham at 11:50am on Sunday at Marvel Stadium before the seniors take on St. Kilda at 3:20pm.